Networked-attached storage (NAS) is a speedy, convenient means of backing up data. 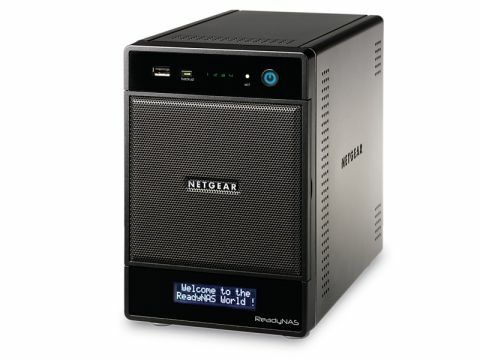 Modern units, such as the ReadyNAS Ultra 4 featured here, are also capable of streaming any multimedia files stored on them to any Smart device that can accept them. The four drive bays of the heavy and massively-built ReadyNAS Ultra 4 can each accommodate 2TB drives and so a combined total of 8TB is possible – that's an awful lot of video, photos and music. The Netgear ReadyNAS Ultra 4 supports various implementations of RAID technology, which trades off available capacity against protection for your data. If one of the drives fails, you should be able to recover your files. Features like 'RAIDar' and 'X-RAID 2' help you make the most of this useful feature. Powered by a dual-core 1.6GHz Intel Atom processor, it's speedy and responsive. The onboard DLNA 1.5 media server worked well with a variety of networked players. Even multiple full HD video streams were glitch-free. Useful multimedia features include a Squeezebox server and iTunes compatibility. As far as computers are concerned, this NAS is equally at home with Windows and MacOS. And it will, of course, also work with Linux. Also, if you're interested in adding more functionality, you can get Applets (such as BitTorrent) which can be downloaded from the Netgear website. On the down-side, I couldn't get it to join my Windows workgroup, as it has a space in its name and the Ultra 4 didn't like that, forcing me to either create a separate workgroup, or rename the existing one (and change the settings of every connected device). Thankfully, Netgear confirmed the bug and fixed it with a firmware release. The (secure) web interface may be powerful, but every time it's accessed with Windows Internet Explorer 8 a 'certificate error' warning is displayed. But this can be ignored. Sadly, only 3.5-inch drives are supported, while 2.5-inch models run quieter and consume less power.